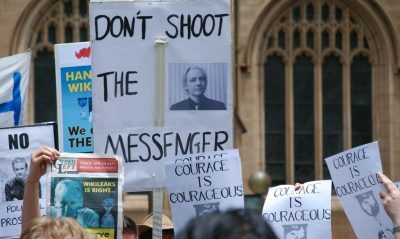 In other words: if this bill passes, Wikileaks will be categorized by U.S. Intelligence in the same way as will the intelligence services of Russia, Iran, Syria, North Korea, and other countries that the U.S. Government wants to conquer. (Whereas the Cold War ended in 1991 on the Russian side, it secretly has continued on the American side.) Cooperation with Wikileaks would then be treated by the U.S. Government as treachery, the same as cooperation with Soviet intelligence was treated when the Republican Joseph R. McCarthy (backed by the Democratic Party’s Kennedy family) held sway over the U.S. Senate, from 9 February 1950 to 9 March 1954. Though this was the situation during the Cold War (prior to its having been ended by Russia in 1991), the time when there existed an authentic ideological reason for the U.S. Establishment’s opposition to the Soviet Union’s ruling Establishment (and when there existed not only the ongoing thirst for conquest of the entire world by the U.S. aristocracy), America’s Establishment (the aristocracy and its agents) is trying to restore that hostility now, 26 years after 1991, which was the year when the Soviet Union broke up, and after which, only Russia remained, and when communism had ended, and when the Soviet Union’s military alliance with the Soviet Union’s surrounding nations, the Warsaw Pact (mirroring America’s NATO), also ended — all of that happening in 1991. The real question that is being posed by this attempt to link future funding, of the U.S. regime’s intelligence agencies, to the aristocracy’s already near-monopoly on the reporting of international ’news’ and of domestic politics, is: Will the U.S. aristocracy unite behind it, as they already have virtually united behind the attempts to conquer Russia, and to conquer any nation that’s friendly toward Russia, such as Syria? Ever since the U.S. regime and its ‘news’media lied about ‘WMD in Iraq’ and said blatantly false things about Iraq such as that the IAEA had just reported “they were six months away from developing a [nuclear] weapon”, and invaded and destroyed Iraq on that basis, it is clear that the U.S. is a dictatorship, not a democracy. The U.S. Government is doing what the Nazi German Government did starting in 1939 — invading foreign countries on the basis of lies — and for which the Nazis were prosecuted at the Nuremberg Tribunals after WW II. It is the general view that no political, military, economic, or other considerations shall serve as an excuse or justification for such actions; but exercise of the right of legitimate self-defense, that is to say, resistance to an act of aggression, or action to assist a state which has been subjected to aggression, shall not constitute a war of aggression [so, for example, Iranians’ taking back control of their country in 1979 and ousting the foreign oil companies was not, at all, ‘aggression’, despite U.S. lies saying it was]. Anyone who would want to know the detailed historical background of the present effort (such as in Congress’s funding-bill for the intelligence-services), by the U.S. aristocracy, to clamp down in their control over the ‘news’ that their victims see and hear, will find extremely enlightening the masterful 28,000-word report by Nafeez Ahmed, titled “How the CIA Made Google”. One can certainly call a Government like that an “empire,” but to continue calling it a ‘democracy’ would reflect nothing more than one’s being fooled by that regime. For example: this news-report is being sent to TIME, the New York Times, Washington Post, The Nation, The Atlantic, and all news-networks and other major ‘news’media in the U.S., but if you web-search the title here, “Bill in Congress to Fund CIA & NSA Outlaws Wikileaks” and look to see how many of them are actually publishing it, the count will be zero, unless one or more of them breaks from the past, and suddenly decides to transform itself by publishing an article from me (and I’ve sent them so many) exposing them all as being the propaganda-vehicles that they’ve all been — at least, until now. Perhaps if this is to be, in the United States, “freedom of the press,” then Americans will instead need freedom from the press.